This entry was posted on May 19, 2015 by Jessica Anderson. This T-Ball trophy will be a hit with your youngest players! With baseball season ending soon, today's post rates our top 10 baseball and softball trophies, medals and coach gifts. Trying to choose my favorite trophy is like trying to choose my favorite child; they are all fantastic, otherwise we wouldn't sell them! However, there are a few awards that rise to the top and stand out above the rest. All of the personalized awards mentioned below have 5-star customer reviews and are staff favorites. They also include engraving in the price. Check them out below and read what other customers have to say! #10: Most Popular T-Ball Trophy: Our T-ball Team Participation Trophies make great participation awards for the youngest players. 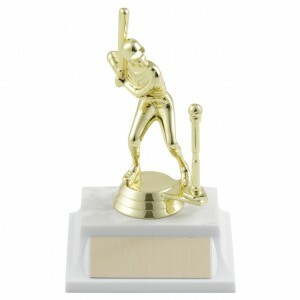 These small trophies feature a batter on a base with a choice of a girl or boy figure. What I like about these trophies is that they are small, inexpensive and kids love them. #9: Favorite Baseball Medal: What's cool about the 3-D Baseball Medals and 3-D Softball Medals is that the full color ball pops out of the front and the back includes engraving of the players name, team name, and year. Kids love to hang medals in their rooms or clip to their backpack. #8: Best Dog Tag: Dog Tags are something unique and different, yet make a great token for a season well played. My favorite is the Black Baseball Dog Tag and the Black Softball Dog Tag. These also include personalized engraving in the price. This cute baseball trophy is available for softball too! #7: Favorite Resin Trophy: The trophy with the best online reviews that is also very cute is the Color Ball and Glove Resin Trophy. There is a choice for baseball and softball. These are heavy, well made, and extremely popular. #6: Newest Column Trophy: New for baseball and softball this season, our Boys Baseball Column Trophies and Girls Softball Column Trophies will be popular choices! We featured these trophies for soccer the past 2 years, and they were great sellers. They are a great choice for a team that has been playing for a couple of years. #5: Favorite Trophy: Well, this isn't really a trophy, but kids LOVE these! Our extremely popular Personalized Baseball Bats will be a hit with your team! These mini wooden baseball bats are American made and include customized laser engraving. 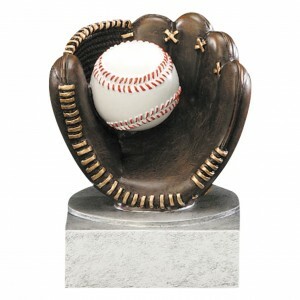 #4: Championship Trophy: This Homerun Riser Trophy is awesome, because you can choose the trim in the center of the ball. A good value, these substantial trophies will make a great impression on your championship team! #3. Best Sponsor Award: Thank your sponsors for their support with a Picture Holder Plaque. This popular award makes a great coaches gift too! This beast has room on the sides to engrave years of winners! #2: Favorite Coach Gift: Our Etched Clear Coach Clipboard is a homerun for a baseball coach gift. This award is not only useful and affordable, but also sturdy for practices to come! #1: Best Perpetual Trophy: Our Perpetual Baseball Beast Trophy makes the top of my list! Not only is this beast totally awesome, but our monster trophies were our Product of the Year in 2012! 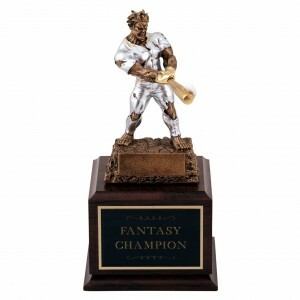 This trophy is perfect for a fantasy baseball league or any baseball team that needs to pass it around from year to year. I hope this helps you choose the perfect award to celebrate the season!